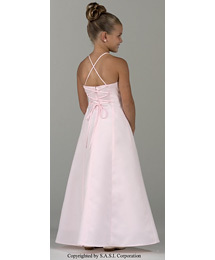 Description: Avanti Satin princess line dress features spaghetti straps and back lace-up detailing. Pricing: Please contact a local retailer for pricing. Use our Store Locator to find a retailer near you. Images and logos used on this website are the property of Bridal Originals and are protected by the copyright and trademark laws of the United States. Any reproduction or use of such images or logos without the express written consent of Bridal Originals is a violation of the laws of the United States and will be prosecuted accordingly. Web Site Design and Development by Cybermill Inc.